The Q Partnership was formed in 1986 by three independently owned family run businesses - V.A.Whitley, Friars Pride and Henry Colbeck, each with a long history and experience in supplying to the Fish and Chip and Fast Food industry. The Q Partnership distributes a range of in excess of 1,200 individual frozen and ambient products to over 6,000 Fish and Chips takeaways and restaurants across the U.K. In total, we operate over 95 distribution vehicles capable of delivering both frozen and ambient products and we have 30 experienced Field Sales Managers to help and support your business needs. The Q Partnership has 12 distribution centres across the U.K, in total. The Q Partnership companies aim to supply you with quality products at competitive prices. We work together to source products competitively and to initiate product and marketing innovations and to create Nationally marketed quality brands and products to the fish and chip shop trade. 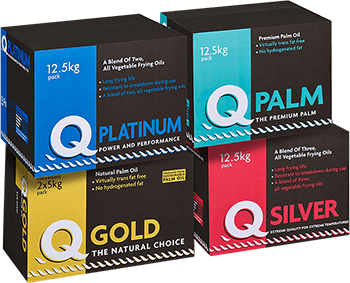 The Q Partnership brands are among the leading products sold into the Fish and Chip and Fast Food market.